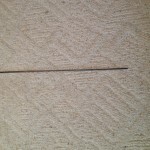 This is one of the longest vent picks used during the war. It is 21 inches long, and would have been used on Seacoast Artillery. Seacoast Artillery was some of the biggest cannons used during the war. They were used to guard waterways and forts from enemy ships. Some of this artillery could fire a several hundred pound projectile up to 5 miles out to sea. 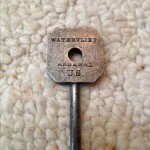 This vent pick is pretty rare because it is Watervliet Arsenal stamped, with the inspector’s initials.